The Need for this Artwork arose after a conversation with the owner of Live and Let Live Farm Sanctuary in NH, Theresa Paradis. Her stories and experience running a Sanctuary, provide ideal insight into the troubles facing Sanctuaries around the world. We Hope that this Artwork can be used as a fundraiser by Sanctuaries in order to alleviate some of the financial concerns they face, while also spreading beauty, positivity, a love for Animals, and the importance of funding the Sanctuaries they call home. 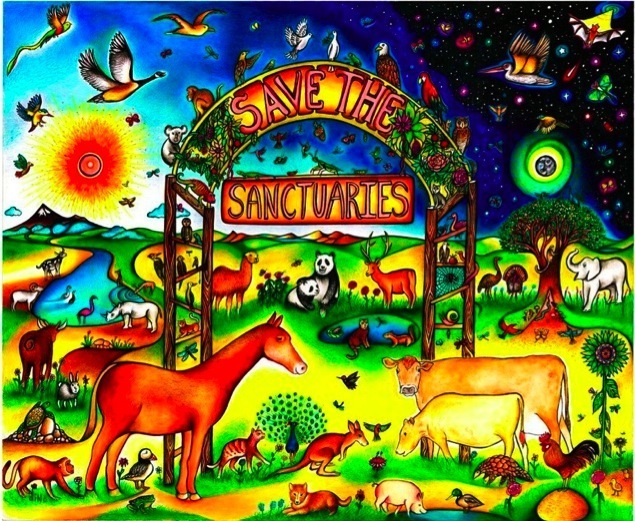 First : Do You know of a Sanctuary that is in need of funding that may want to receive FREE Save the Sanctuaries Artworks in order to fund raise for their Animals welfare?? Second : If YOU would like to purchase the ART as a Gift for yourself, or others..
AND have your purchase profit$ go towards a specific Sanctuary and Save eARTh..
Third : If you are positively effected by the Art, but don’t have any money to give or purchase... then simply find your closest Animal Sanctuary, and Donate some of your time to helping out. They will appreciate it, you will make new friends (human and animal), and will certainly share some priceless moments and experiences improving the quality of life for some wonderful beings of the Animal Kingdom.